Gasper Landscape Design & Construction: ‘Outdoor living perfected’ - Times Publishing Newspapers, Inc.
Bob, Paula, Dana and Bobby pride themselves in not only their love of the business, but their accomplishments in becoming an award-winning and widely praised full-service design and landscape company and garden center. Gasper’s six-acre nursery and greenhouse offers landscape products, pond supplies, gardening accessories, outdoor furniture, pottery, unique gifts and seasonal home decor that truly define them as a one-stop-garden-shop. You’re sure to find an abundance of inspiration to help you personalize all your indoor and outdoor spaces with a distinctive look. Gasper offers landscape and hardscape services, garden center services, DIY hardscape supplies and bulk delivery services. Shop Gasper in-store or online at shopgasper.com. Their retail center is open year-round and staffed with gardening, pond care, furniture and furnishings and hardscape experts to assist you with all of your landscaping needs. Worried you don’t have a green thumb? Don’t be – Gasper can help! Their expert staff is always available to answer all your plant questions and assist you with your gardening needs. Also try one of their many informational seminars or Do-It-Yourself workshops offered throughout the year, offering good advice and coaching so that your garden will be the envy of the neighborhood in no time. You’ll be able to find your vegetable garden preparation and seed starting needs at Gasper as well. They currently have a large selection of tropical plants that came in after the Gasper family’s trip to Florida. At Gasper, you can also celebrate the changing seasons with family-fun, kid friendly events. On behalf of the Gasper family and entire staff, they welcome you to discover the Gasper difference and see for yourself why they have earned the distinction of being Bucks County’s finest landscape company and destination garden center. For more information, visit them online at www.gasper.net. They have weekly web coupons that make it worth checking out, as well as in-store specials. Be sure to stop in and see what makes Gasper so great, located at 316 Tanyard Road, Richboro. Garden Center hours from April through June are Monday through Friday, 8:00am to 8:00pm; Saturday, 8:00am to 7:00pm; and Sunday, 9:00am to 6:00pm. Contact them by phone at 215-398-6030, or by email at info@gasperls.com. 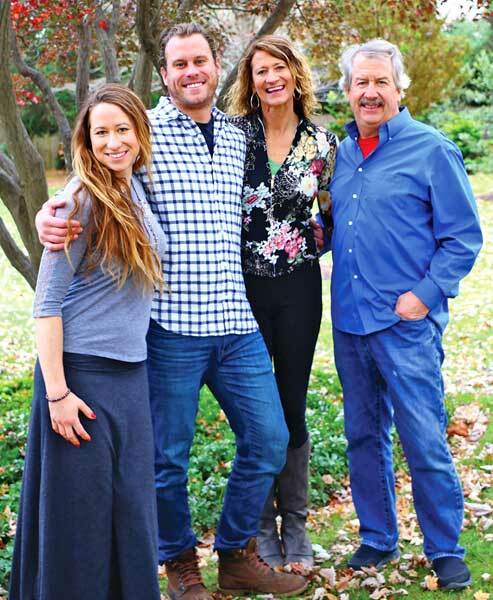 PHOTO CAP: Family ties – hard to believe more than 30 years have passed since Bob Gasper first started Gasper Landscape Design & Construction. Pictured left to right, Dana Gasper, Bobby Gasper, Paula, and Bob Gasper.